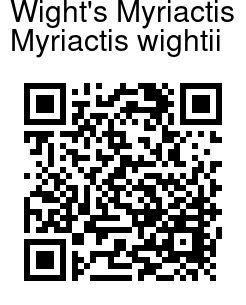 Wight's Myriactis is an annual herb, 20-90 cm tall. Flower-heads are few or numerous in terminal, lax clusters carried on 0.4-5 cm long stalks. They have a large yellow center, with small white ray-floret on the periphery. Flower-head cup is hemispheric, about 1.2 cm in diameter in fruit. Phyllaries are 2- or 3-seriate, narrowly oblong to lanceolate, Ray florets are 2-seriate, tube about 0.4 mm, lamina linear, 0.8-1 × 0.1-0.2 mm, tip blunt, sometimes 2-lobed. Disk florets limb is bellshaped 0.8-1 mm, 5-lobed. Leaves are often with axillary branches or fascicled. Lower leaves are ovate, or sometimes lyrate-pinnately lobed, terminal lobe ovate. Middle stem petiole is broadly winged, blade broadly to narrowly ovate, 5-8 x 3-6 cm, hairy, base stem-clasping, margin deeply toothed, entire in uppermost leaves. Seed-pods are greenish to pale brown, 1.5-2.5 mm. 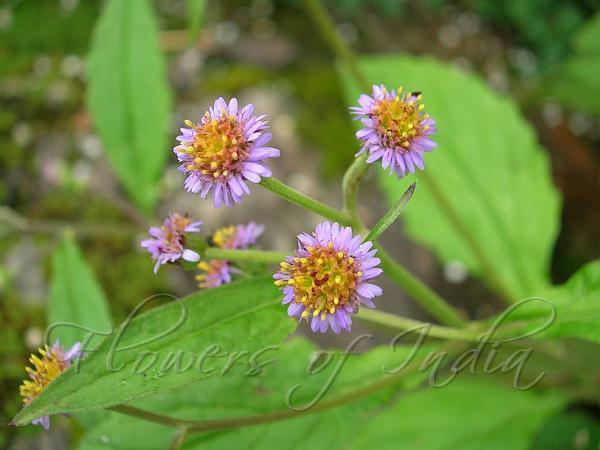 Wight's Myriactis is found in forests on slopes, grasslands, streamsides, in the Himalayas, at altitudes of 1900-3600 m. Flowering: July-November.